..and the tortoise beats the hare by a neck"
"Terry, did you by any chance drop one of your viagra tablets in the garden?" Breeding these poor creatures to have long necks is so wrong. I'm turtley against it. 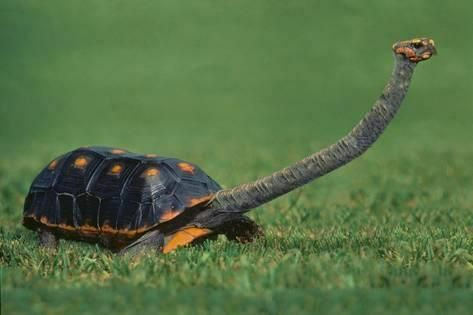 Fun Fact: food swallowed by tortoises travels faster than the tortoises themselves. We had to examine this fella in biology. To be honest it tortoise nothing. We call him Perry. Perry Scope. I am so sorry, I thought it was a toy the kids were swinging around. Before I got this shell I use to live in a block of flats. Lettuce must be getting harder to reach. "Sh*t, Rod Hull is coming this way!" Plot twist: that's not the "head" you think it is. The fashionable people can now hold their hat in place using this terrapin. We're taking him to the vet. His farts really stink. He’s part of our research program. We’re taking turtle care to the necks level.